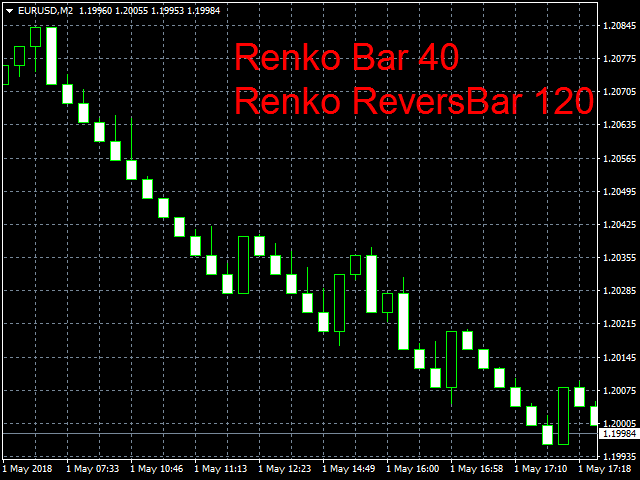 The Renko_One_ReversBar indicator is an evolution of the indicators Renko_Bars_3in1 and RenkoRangeBars FlatBar. The main feature is that only one Reversal Bar is drawn. 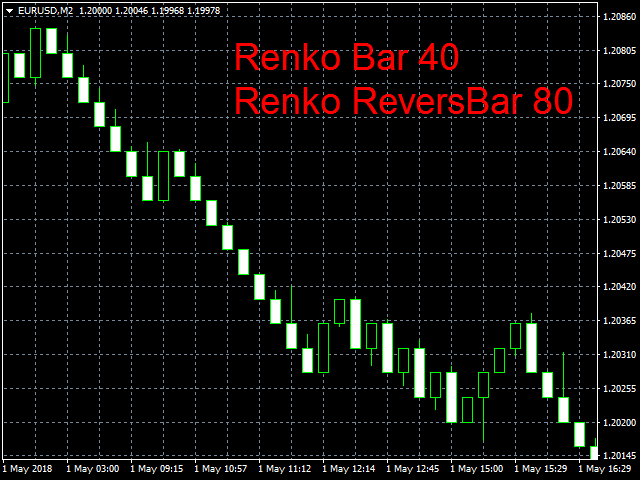 As in the indicator Renko_Bars_3in1, you can independently adjust the size of the reversal bar. 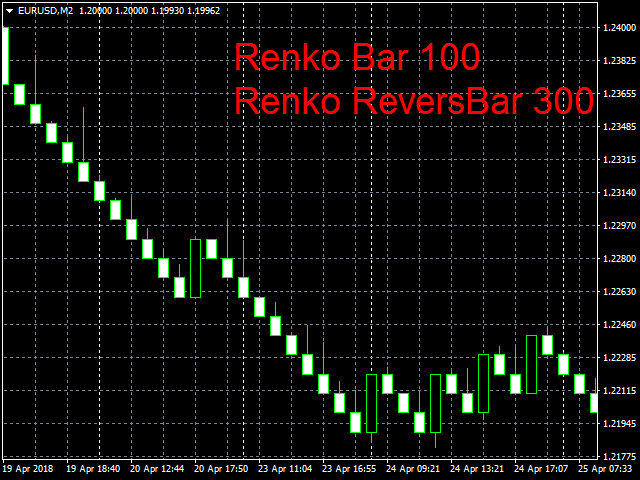 A chart created using Renko_One_ReversBar can be used for all types of trading. For testing, download the Demo version Renko_One_ReversBar_Demo running on a pair of NZD/USD. Important. To build an offline chart, you need a chart with a period of M1. When you launch the indicator on the chart, the offline chart opens automatically. When closing the terminal, also close the offline chart, because the next time you start the terminal, another offline chart opens. If this situation occurs, close the offline charts and restart the indicator. 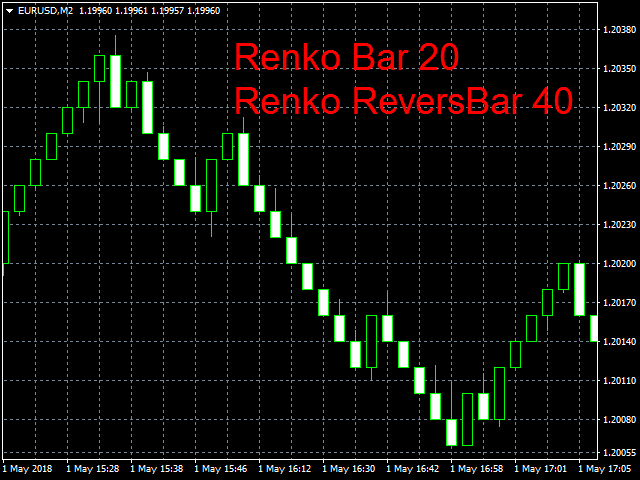 The chart created using Renko_One_ReversBar, does not redraw the Open value of the current bar and the Close value of the previous one, which is important for a proper operation of indicators and Expert Advisors. Also the indicator enables testing of indicators and Expert Advisors in the Strategy Tester. ShowWicks - Show shadows (true/false).